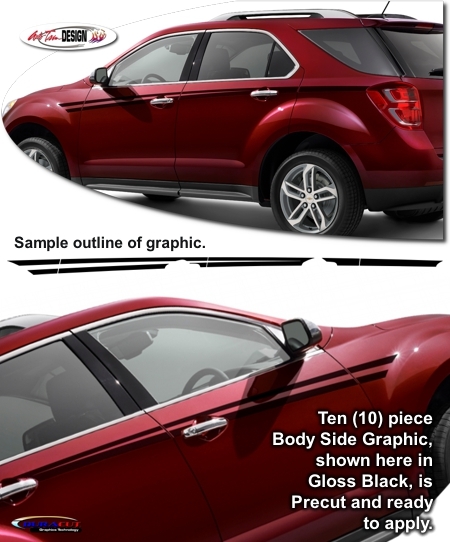 Make your '10-Current Chevrolet Equinox unique with this great looking Body Side Graphic Kit. This easy-to-apply ten (10) piece kit is PRECUT and ready to install in a wide variety of colors - NO TRIMMING required! This stripe package is not just a set of straight strips in a box. Our graphic kit consists of prefitted and contoured pieces that are specifically made for the '10-Current Chevrolet Equinox and will not fit any other vehicle. Graphic kit is designed to be placed along the Equinox’s distinct body line as shown in product image. Dryfitting pieces prior to application is recommended to become familiar with proper placement.